Budget Electric is committed to getting the job done right so that you and your family are safe in your new home. 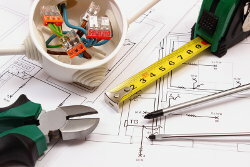 Whether you are building a new home or rewiring an existing one, the Iowa Electricians at Budget Electric can work with you to design the best residential wiring plan possible. Do not pay a large contractor a fortune for the same high quality service you can get from Budget Electric. At Budget Electric, we want you be happy in your brand new home and a properly wired new construction home is a big part of that. There are dangers in not using a fully licensed and insured electrician. Faulty installation and improper grounding are serious hazards. Incorrect operation and poor maintenance of electrical equipment can also cause damage. By choosing Budget Electric as your residential electricians for your new home, you are getting a dedicated, hardworking team that is committed to providing all residents of Dubuque, IA with new home wiring services. Budget Electric can work with you to design a wiring plan that meets all of your present and future residential electrical wiring needs. . We are a friendly team of Iowa electricians who understand that you want a reliable and cost-effective solution. Budget Electric has over three decades’ worth of experience providing the most difficult wiring installations for new homes. We continually strive to ensure total customer satisfaction. If you are building a new home in Dubuque, Iowa or surrounding areas in Illinois, call the Master Electricians at 563-590-5679. Free estimates and consultations available. No job is too big or too small. We offer flexible hours and emergency service. Call today.